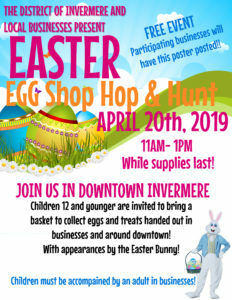 Join us in Downtown Invermere on April 20th, 2019 from 11am-1pm (while supplies last) for the Downtown Invermere Easter Egg Shop Hop & Hunt. 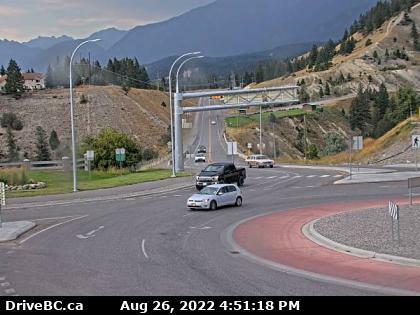 Presented by the District of Invermere and local businesses. Children 12 & younger and their families are invited to bring a basket to collect eggs and other treats from our downtown businesses! Participating businesses will have a poster in their window! Easter eggs for children will also be hidden outside in downtown Invermere as an addition to treats handed out by participating businesses! Some participating businesses will be offering adults in store discounts and coupons hidden in eggs outside. Other Easter activities will be taking place… including face painting at Fire Vixen Emporium, crafts at the Invermere Public Library, coloring contests and more! This is a free event to enjoy! Follow this event on Facebook at Invermere BC Events for all event updates and participating businesses! Are you a business that would to participate in the Downtown Invermere Easter Egg Shop Hop & Hunt? Contact District of Invermere Events Coordinator Cortney Pitts events@invermere.net 250-342-9281 ext. 1232.